When defining the best propane grill under $300 it is important to note that not every model is right for every home. Every grill enthusiast has different needs as well as different budget constraints. It’s important to consider everything that is available so that you can find the perfect one for your unique scenario.The following grills have all been chosen based on price, performance, and the features that they offer. While each one can offer an excellent grilling experience, you may find that you prefer the design or even the price of one particular grill when compared to the other models.If you’re ready to find your next grill, simply read on for the details. The grill should feature at least three burners. It should have cabinet or shelf space underneath for storage. It should include side shelves for convenience when cooking. The design should be attractive. The build quality should be high and worthy of a long term investment. It’s the perfect example of how premium features can come in an affordable package. Some grills will make you compromise when it comes to these features, and many consumers wrongly assume that you need to spend $500 or even more to get all of the design features that make a grill enjoyable. This would be incorrect, as is evident with the 4 Burner Propane Gas Grill from Monument Grills. 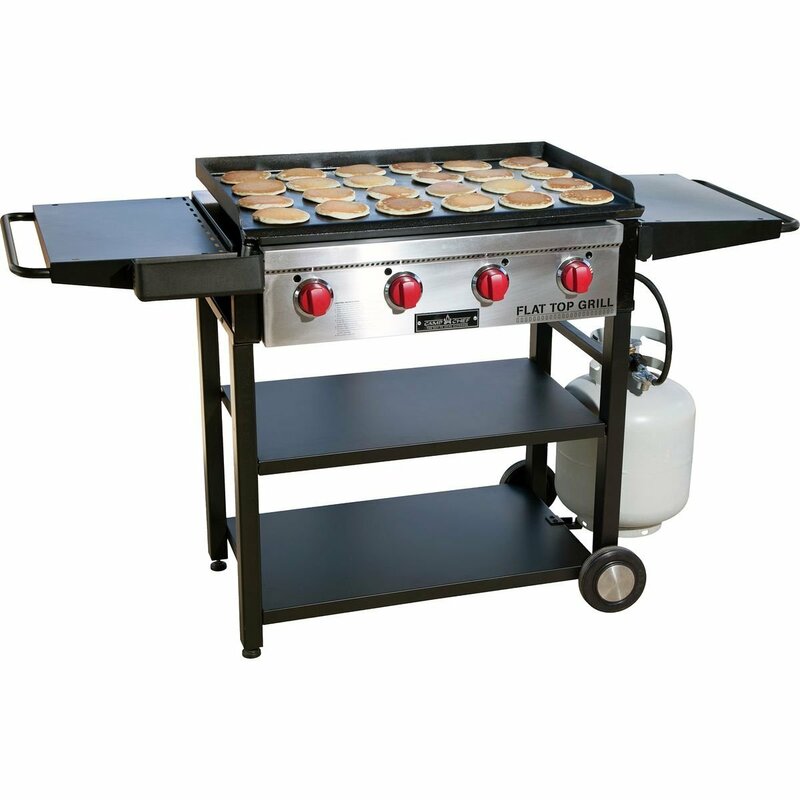 .To get the basics out of the way, the grill features four burners for a total heat rating of 72,000 BTU, it has a side gas burner with a closing lid, it has double door cabinets, and the grill is hooded for top-down cooking. 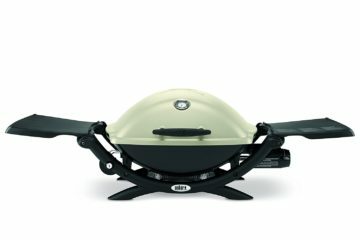 All of these features already make it one of the best propane grill under $300, but there is still more on offer…The grill uses stainless steel burners that are rated for 8 years of regular use, the enamel coating on the grill is scratch resistant and one of the hardest in the industry, and the grill has LED lighting. Although LED lighting might seem like a simple addition, it is important to note that this is something usually reserved for the most expensive premium grills. For cooking, this grill performs well and the cast iron cooking grid offers consistent heat retention for all of your favorite foods. The side burner is great for sauces or anything else that you want to cook in a pot or pan, and the hooded surface makes cooking larger cuts of meat easy. You could grill and bake a pizza, get perfect burgers with plenty of moisture, or grill your steaks with the hood closed to lock in flavor.This is an excellent grill that does everything that you would expect from a grill twice the price. If you have space for a 4 burner propane gas grill, then this one is a great place to start when comparing your options. It features excellent design, a double door cabinet, and even a side burner to make it a versatile outdoor cooking station. The Master Cook 4 Burner Outdoor BBQ is an affordable mid-sized grill that can take care of family cooking and entertainment. It features excellent design, a double door cabinet, and even a side burner to make it a versatile outdoor cooking station. Four burners on this grill mean that it can provide up to 36,000 BTU of heat with all of the burners at maximum setting. This makes it perfect for browning large cuts of meat, or simply searing a few different BBQ ingredients at the same time. The cooking surface is of generous size with 400 square inches on the main cooking area, and a further 118 square inches on a raised warming rack. This is a hooded grill that can allow you to quickly cook all of your favorite foods, and you could even try new things like a roasted chicken, large BBQ cuts, ribs, or any kind of slow cooked BBQ food. The hood has thick walls and maintains temperatures well, and there’s a temperature gauge so that you can closely control the cooking environment inside. There are two large side shelves on this grill, with one of them featuring a convenient side burner. This type of addition is always welcome on an outdoor grill because it means that you can truly replace your kitchen during the warmer months.Use the side burner for a pot of stew or chili, sauces, or even for searing. 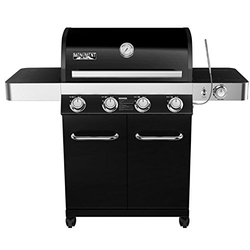 The side burner is rated at 12,000 BTU and is lidded so that you can make use of the shelf space when the burner isn’t needed.While Master Cook isn’t the most prestigious brand in outdoor grilling, this model still has the design, features and build quality to be considered one of the best propane grill under $300. The attractive design is modern and elegant, and you’ll be proud to make this grill a part of your outdoor entertainment area. The double door cabinet underneath provides convenient storage for your gas bottle and accessories.Customer feedback for this grill has been positive, with 86% of owners awarding this grill a 4 or 5 Star review. It features high quality construction, an attractive design, and a generous cabinet for storing your propane and basic cooking accessories. Dyna-Glo is a name that many home grillers know and trust, and this 3 burner Dyna-Glo Smart Space Living Gas Grill is one of the best propane grill under $300. It features high quality construction, an attractive design, and a generous cabinet for storing your propane and basic cooking accessories. The pedestal design of this grill is one of the best that you will find in this price category. It combines a matte black finish with polished steel elements, which could make it the perfect centerpiece of your outdoor cooking area. Overall the rounded look suggests a price far above what you will pay for this model. If you want a real bargain that you will be proud of when entertaining friends and family, this is definitely a model that you should consider. The cooking surface on this grill is cast iron with a porcelain enamel finish. Although many high end grills use stainless steel cooking grates, cast iron is still preferred by a number of grill owners. Iron is known for its ability to retail heat and provide consistent surface temperatures, which will be appreciated during longer grilling sessions.There are three burners in total, which cover a cooking area of 507 square inches. This is more than enough for family cooking and will also provide enough space when entertaining. 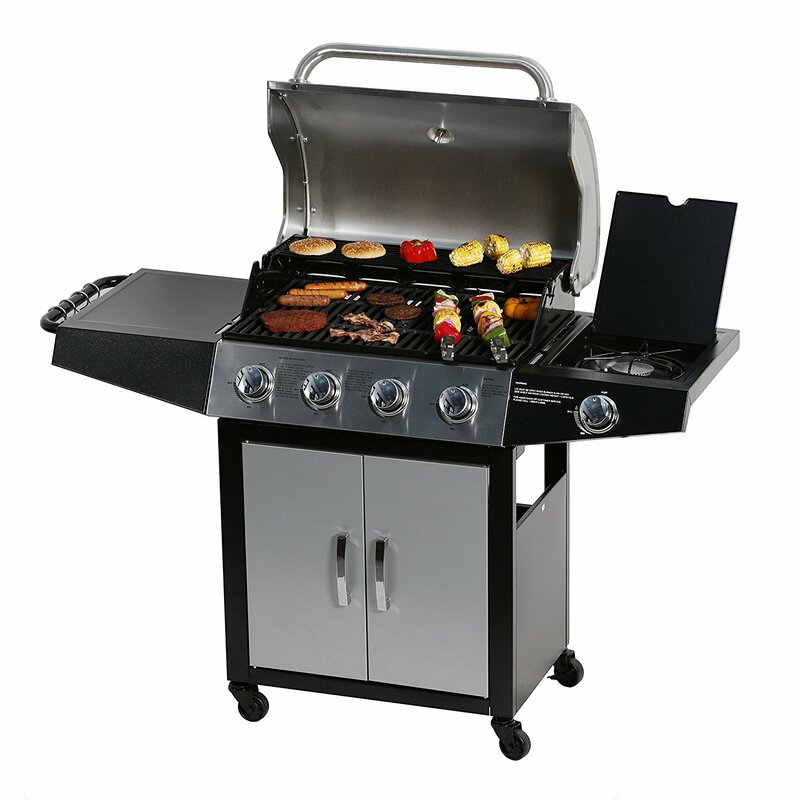 For the largest gatherings you may need to grill your different food items separately, but this is a fair compromise when you are getting such a high quality grill in a compact design.Also noteworthy is the fact that the burners are stainless steel tube burners, and they use heavy steel protectors/vaporizers. This system is identical to what you would find on more expensive Dyna-Glo grills, and also similar to the system used by Napoleon, a manufacturer that is considered to make some of the best grills on the market. The fact that you get these options on a small grill that is also affordable, makes it well worth the investment. The stainless steel hood on this grill is double walled to provide insulation and excellent heat retention. For grilling pizzas or slow cooking large cuts of meat, this is a definite winner. Although the grill doesn’t come with a rotisserie system, it is nice to see that Dyna-Glo has included the mounting points for one. This means that you could use any universal rotisserie kit to turn this into a truly versatile outdoor cooking appliance.This model has proven to be popular since release, thanks to the attractive design and the high quality construction and materials. Current online user reviews average 4 out of 5 Stars, indicating positive feedback from the majority of owners.This model should be seriously considered. 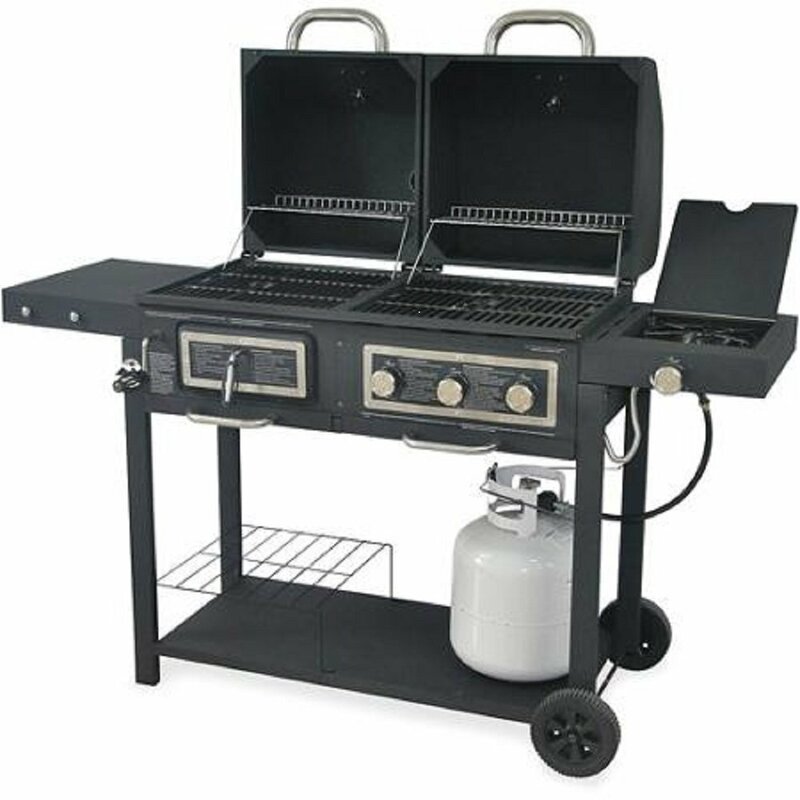 Comes with a Chrome Plated Warming Rack and a Porcelain Heat Plate,3-burner Grill with Integrated Ignition and Also Has a Handy Tool Holders. Unique in this list is the Durable Outdoor Barbeque & Burger Gas/Charcoal Grill Combo from Backyard Grill. This cooker provides all of the benefits of a three burner gas grill, while also offering a completely separate surface and hood for charcoal grilling. If you want the best of both worlds, then this is a model that will appeal to you. There is 295 square inches of gas grill cooking surface, as well as a slightly smaller 262 square inches of charcoal cooking surface. 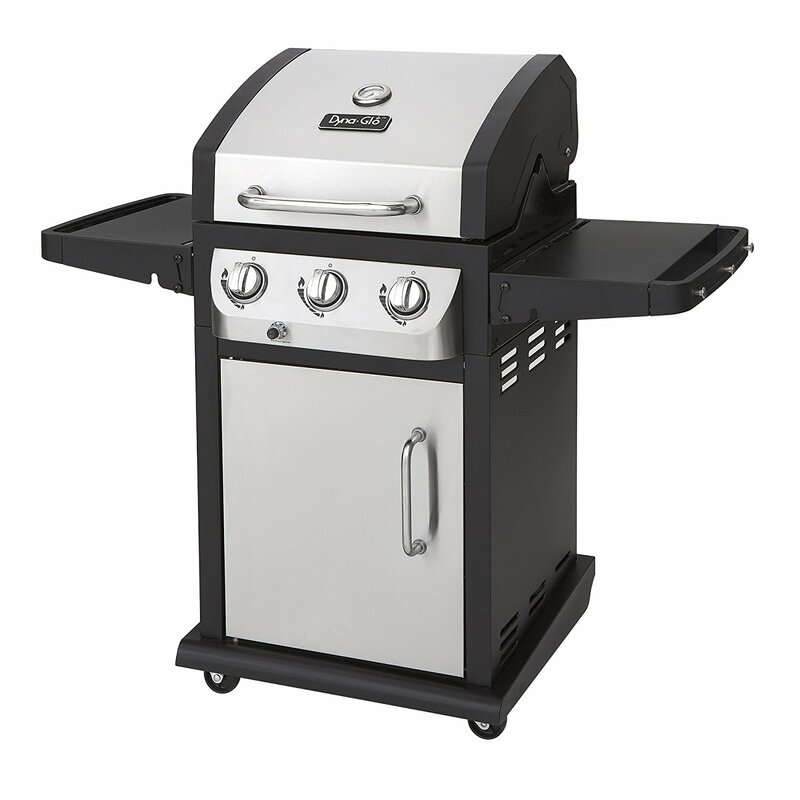 The gas grill features three stainless steel commercial quality burners, which allow you to fine tune your temperature over the entire grilling surface. Combining both gas and charcoal in a single grill comes with a number of advantages. Charcoal is often seen by purists as the best way to grill, because it can impart a unique flavor on BBQ foods.The problem for most people is that charcoal isn’t always convenient, so it’s something that is often avoided when looking for a modern grill. 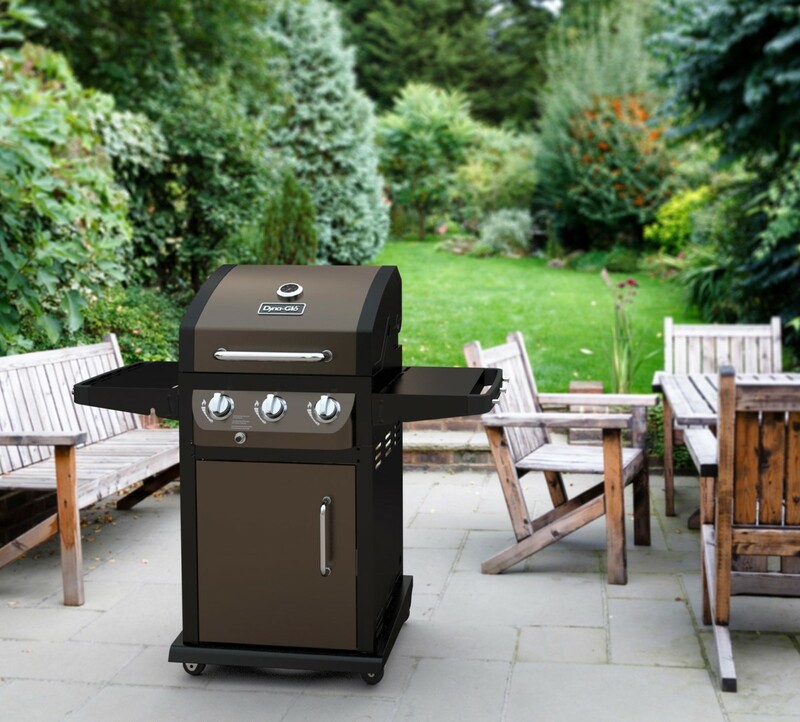 With this model you will have either cooking method when you need it, and you could even use the charcoal area of the grill as a smoker on special occasions.This grill takes things a step further by offering a gas side burner in addition to the main grilling surfaces. This is perfect for adding a pan or skillet for searing, or it could be used to keep a pot of sauce warm, or even for cooking stew. Whatever you use the side burner for, it is a welcome addition that you won’t often find in this price range.The grill is hooded with generous room inside that allows for some closed top grilling or convection baking of pizzas and other specialties. 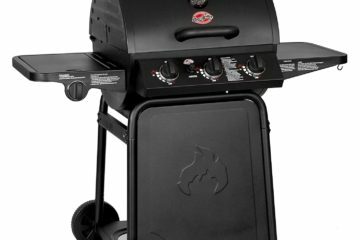 As one of the most versatile options on this list, this is easily one of the best propane grill under $300.Note that this grill does take up a significant amount of space, with full dimensions being 64” x 28” x 49.7”. It’s not the best grill for a small space, and you may want to consider a standard three burner grill if you need to cook in a small outdoor area. While this might initially seem like the less capable option, it might actually be the perfect grill for your needs. Our final recommendation is a grill that takes a different approach, and it will appeal to a different type of owner.The Camp Chef Flat Top Grill doesn’t come with a hood, there is no integrated side burner, and it uses shelves instead of cabinet with closed doors. While this might initially seem like the less capable option, it might actually be the perfect grill for your needs.The ideal owner of this grill is someone who wants a large cooking surface with a flat grilling plate. You won’t be cooking special cuts of meat that require closed top cooking, but will instead be sticking to favorites like steaks, burgers, skewered meats, boneless or small bone-in cut chicken, and sausages or chops. You may even want a grill to cook pancakes and eggs on in the morning, or to fry bacon to a perfect crisp.This is the ideal grill for someone who likes to do things the traditional way on a flat top grill. Although it doesn’t come with all of the extras, it’s one of the best at flat top cooking. There are four burners rated at 12,000 BTU each, and the flat top surface offers 604 square inches of total area. You can even change out the grilling surface for the included cooking grates, allowing you to get some direct heat onto your food and achieve the perfect sear marks. When you only need the basics but you want a grill that is of commercial quality, this is the model that you’re looking for. Each grill in this list is a great buy, and each one offers something a little different. Weigh up your needs and your expectations, and you’ll be able to choose your own version of the best propane grill under $300. With such excellent value in each of the grills covered, you’ll get professional quality cooking at a price that is affordable.